Hello ladies~ Back on September, I was contacted by Mr. Sasagawa from Kawaii Beauty Japan (KBJ) to fulfill a small survey. It is a survey about my skin condition and what kind of product that I need to cure my skin problem. After that, around the last week of September, I received a beauty products (choosen based on my survey result) from KBJ to tried. The product called V 10 Plus Serum. What is V 10 Plus? The letter "V" means Variety. And the words "PLUS" means that you can add our serum to your current skin care regimen. 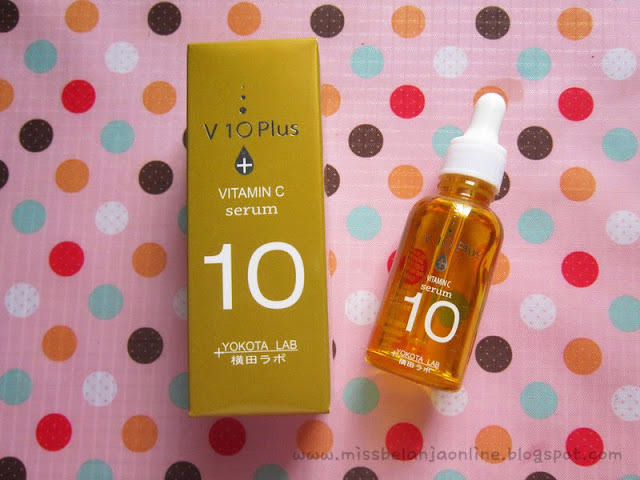 My variant is V 10 Plus Vitamin C-serum which is works for anti acne. 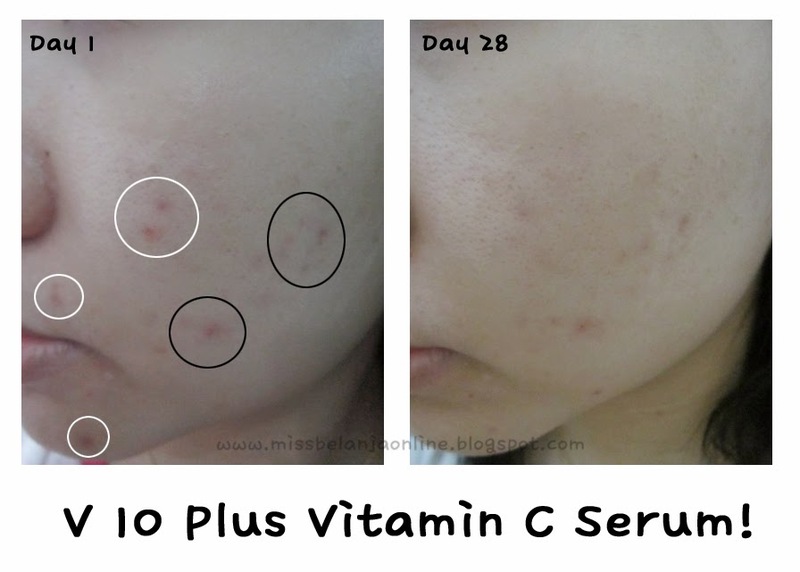 Vitamin C has many good effects on the skin. It helps the synthesis of collagen in the skin, so that the pores are minimized. It also improves inflammatory pimples. For skin beauty, apply Vitamin C directly to the skin rather than take it orally, as in the latter case, large proportion of Vitamin C is used in the body and not for the skin. Pimples and pores. The Vitamin C in V 10 Plus Vitamin C serum is a Vitamin C derivative, which is stable and works efficiently. Also it contains OBAKU which control sebum secretion. Stored in a bottle with glass material and also comes with a pipette applicator. Since my serum is Vitamin C, the color of the bottle and also the serum is Yellow. The packaging definitely not travel friendly because it can be easily broke due of the glass material. The texture is very liquid similar to water. It has sour scent but not really strong. When I applied it on my skin, it absorbs quickly and leave me no greasy feeling. I love something that isn't sticky and absorbs quickly so this serum is one of my favourite. Now let's see my before-after pictures~ Warning: not a nice pict! White Circles~ you can see on the left pictures I got many acnes which I mark with white circle. After using this serum for almost 1 month, you can see I no longer have the acnes anymore on right picture. Black Circles~ The acnes on left picture which I mark with black circle are still there on the right picture. But it's no longer as red as the first one. Basically now it will be more suitable to call it acne scars. So far, the serum works wonderfull to help with my acnes problem. As for my large pores, you can see it still quite visible (and pardon my blackheads >_<). I will continue to use this serum again to see more of good result. But for now, I will proudly say that I'm satisfied of this serum. Thank you so much for Kawaii Beauty Japan for introducing me to this serum. 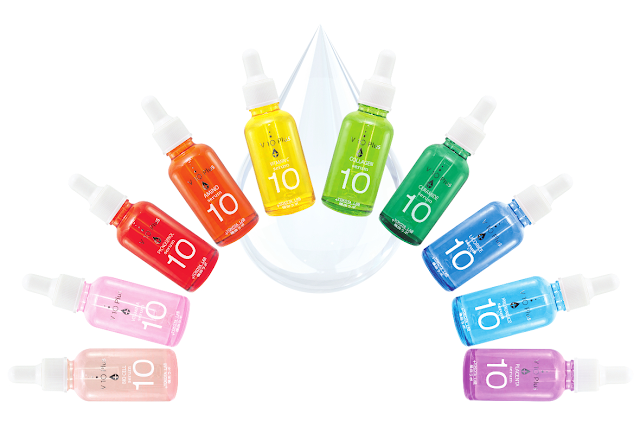 If you want to know another reviews about V 10 Plus Serum, you can visit another KBJ Stars blog. To know more information about another KBJ Stars you can click here. Masih belum tahu harganya na soalnya belum masuk ke Indo, tapi sebentar lagi denger2 mau masuk ke Jakarta..
Hello Christopher, as far as I know, this serum is suitable for all skin type. I have an oily skin and eventhough my skin isn't sensitive, I tends to get break out easily. But so far, it doesn't break me out and further more it helps to reduce my acne (I've already finished this serum last month). As for the application, usually I go with the serum first.